Americans have different words for soft drink depending on which region of the United States they’re from. 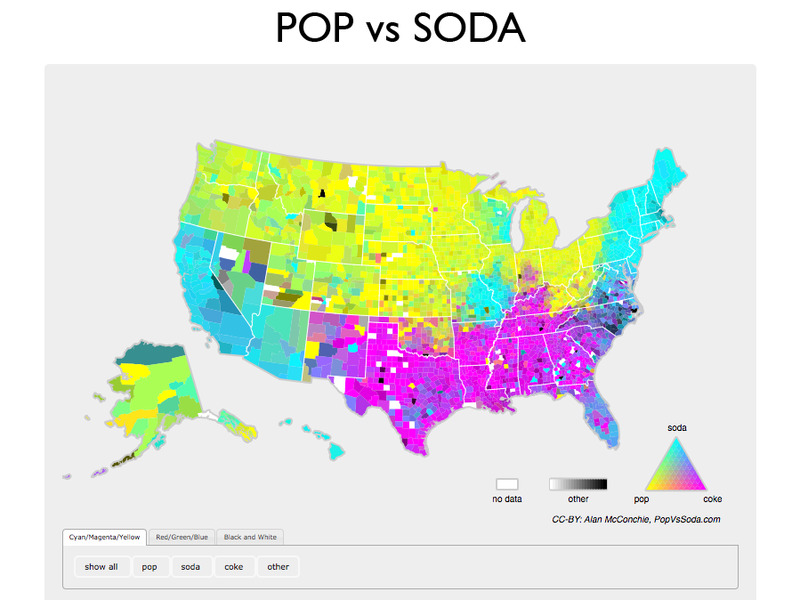 The three most popular terms are soda, pop, and coke, according to data collected by the site Pop Vs. Soda. Linguists have noted other terms people from certain regions use for soft drinks, including tonic and cocola. One of the things Americans can never seem to agree on is what to call fizzy, carbonated beverages: soda, pop, or coke? That’s exactly the question cartographer Alan McConchie sought to answer with his web project, the aptly named Pop Vs. Soda. The site invites visitors to fill out a brief questionnaire asking where they are from and which term they use for soft drinks. To date, more than 400,000 users have submitted answers. Whether you call it pop, soda, coke, or something else entirely, there’s no question that Americans won’t be agreeing on its name any time soon.